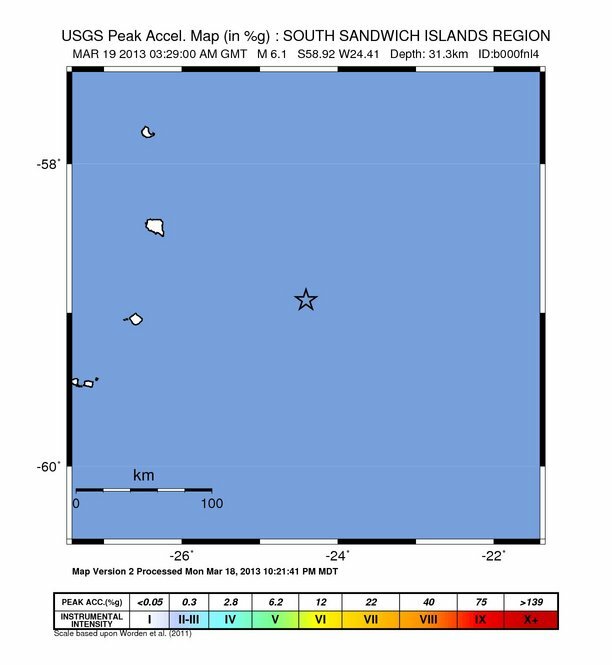 Strong earthquake M6.1 struck South Sandwich Islands on Tuesday, March 19, 2013 at 03:29:00 UTC. Epicenter of the earthquake was located 121 km (75 miles) E of Bristol Island, Antarctica at coordinates 58.915°S, 24.410°W. USGS registered depth of 31.3 km (19.4) miles whereas EMSC reported M6.0 at depth of 100 km (62.13 miles). According to GDACS, this earthquake can have a low humanitarian impact based on the Magnitude and the affected population and their vulnerability. There are no people living within 100 km radius of the earthquake.